I’m thinking of opening a store for The Final Wager, with the goal of raising awareness of a malady that still plagues Jeopardy! contestants: Terrible Strategy Syndrome. I model one potential item in tonight’s video. Please buy generously. For the children. Dark Lord, birth name Darren, has it locked up – but let’s rewind two clues to his Antepenultimate Wager. Dark Lord should assume Phil is going to nab that last $400 clue. That’ll put him at 11,200. So Dark Lord should wager to get up to 22,401: $3,201. For unknowable reasons, he wagered $2,700 which put him in a lock position for the moment. The remaining clue asked for a Central American country, and a correct response would have given Phil a shot in Final. I’m tempted to give Phil a ‘gray’ wager just for the hell of it because it’s clear he didn’t come to play. There was no reason for him not to be doing that math during the Daily Double. All of that wouldn’t have mattered, because Phil missed Final (and Dark Lord got it). 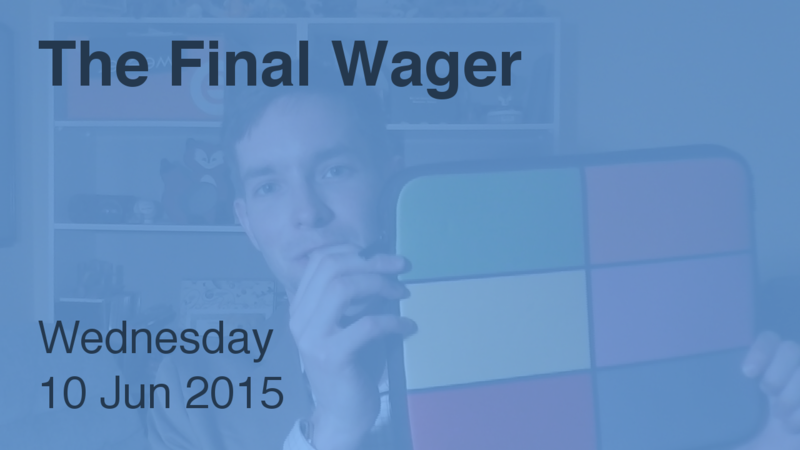 But here at The Final Wager, it’s always means over ends. Phil still takes home an extra $1,000, though, because he didn’t have to wager anything against Martha. At the beginning of the game, Phil was picking the categories. No one got any answers right for several clues, then Alex switched to asking Darren where to go. Any idea why? Alex just got confused. The contestant coordinators mention this possibility in the pre-game pep talk, and tell contestants to keep going if it does happen.